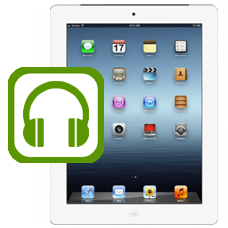 If your iPad 3 has started to develop sound issues and will not play music through the headphones then this is the repair you require. Allow our in house technicians to replace the headphone socket assembly inside your iPad, this repair involves removing the complete front screen so is not advised to be undertaken at home. * If you choose not to opt for our Express Repair 24 Hour Fast Track Service our normal repair turnaround times are 2 - 4 working days. We always aim to complete repairs as fast as possible. This is an in-house Apple iPad 3 repair service, when ordering this service you are required to ship your iPad into our repair centre for works to be undertaken.